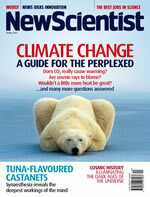 Now, New Scientist magazine has published a special issue about Climate Change, and it addresses many of the myths surrounding global warming. The key points are available in a series of articles on the New Scientist web site. They present a balanced view of the arguments, and I think they successfully challenge the points raised in the documentary. What I took away from it is that while the Sun does indeed act as the main source of heat for the planet, human-generated CO2 is the best candidate for the recent trend of increasing temperatures. It is also clear that there is a large degree of uncertainty around the role of clouds in the global climate. However despite the uncertainty the majority of scientists working in this field are convinced that human-caused global warming is real, and we need to act sooner rather than later.